These photos were taken by Akemi, a single mother who had voluntarily evacuated from Fukushima City to Kyoto, over 500 km away, when she visited her parents' home in Fukushima City in March 2013. Due to the effect of environmental radioactivity, please be careful of the following points in using the park. Please limit the use of the park to 1 hour per day. Please wash your hands and face and gargle after using the park. Please be careful not to put soil and sand in your mouth. This is the park where the sign is posted. Akemi says identical signs were posted at three parks near her parents’ house. The sand pit is covered with blue tarp and weighted down. Akemi says this park used to be a green park. Akemi had sent her son to Kyoto by himself first, but while she was visiting him in Kyoto for a week in August 2012, the green park was turned into a regular playground. Was it part of the decontamination effort? Akemi says there is a child who walks through this park every day on the way to school. This photo, taken from a slightly different angle, reveals a part of the body of a green and white heavy-duty excavating equipment visible in the upper left. 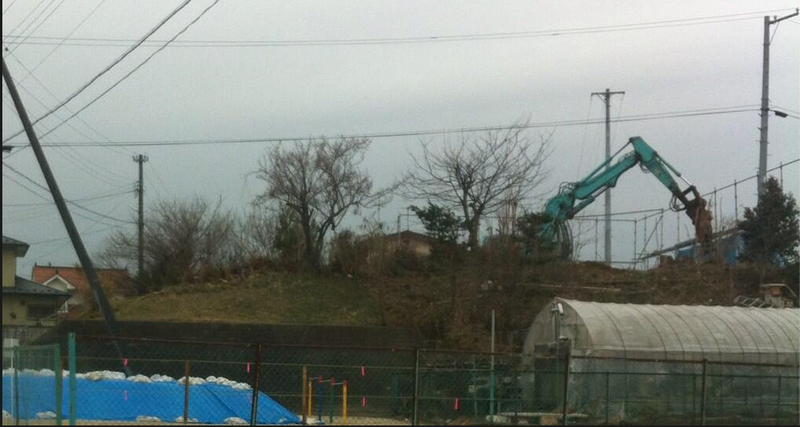 From yet another angle, the photo reveals what appears to be a construction site above the park. In fact, there is a house being built there. Akemi got closer to the construction site to shoot this photo. The Radex radiation detector shows, "0.52 μSv/h." Any park will have official air dose rates displayed after decontamination. 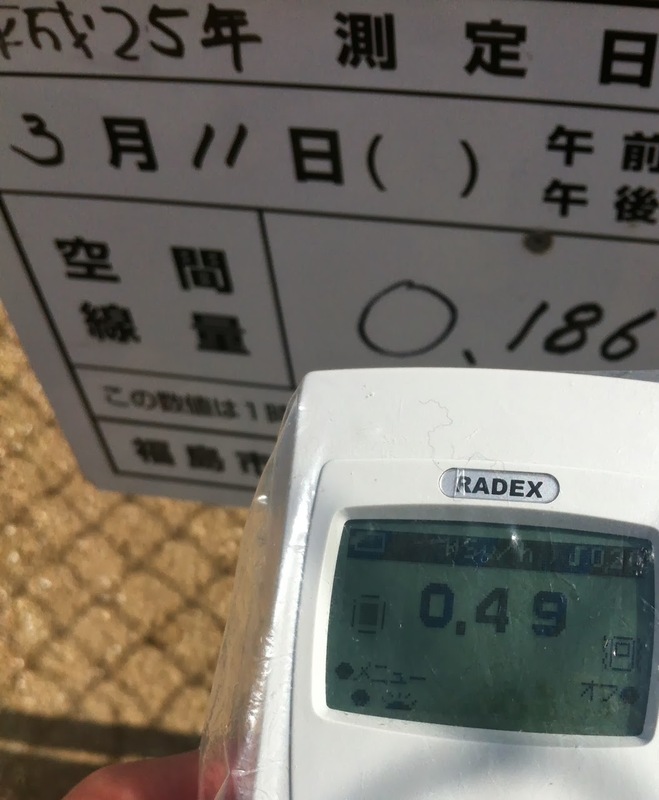 The sign at this park states the measurement was taken on March 11, 2013, and the air dose rate is 0.186 μSv/h. However, Akemi's Radex registers 0.49 μSv/h, nearly 2.5 times as high as the official air dose rate. 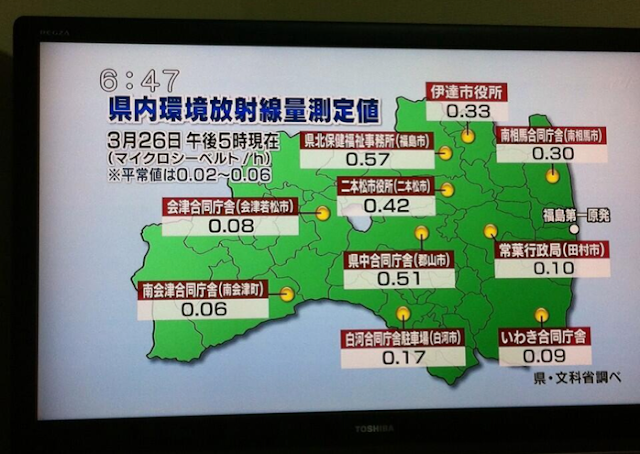 Incidentally, Fukushima television stations show "Fukushima environmental radiation levels" as in this photo, accompanied by light and easy music, as if it were weather forecast. By the way, these signs have been posted at various locations in Fukushima City since April 25, 2011. This is a translation of a Kyodo article dated April 25, 2011. 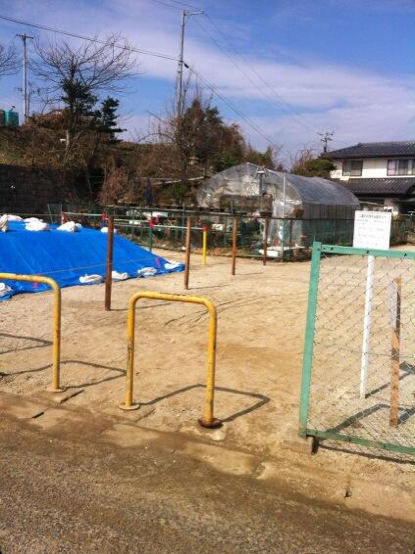 Fukushima City installed sign posts at two of its parks on April 25th, where the atmospheric radiation level exceeding the national regulatory limits (3.8 μSv/hr) was detected, warning park visitors, "Please limit the use to about one hour daily," and the sandpit was covered with blue tarps. Despite the distance of over 60 km from Fukushima Daiichi nuclear power plant, "Shinobuyama Children's Forest Park" had an atmospheric radiation level detected at the same level as the national regulatory limit. Usually there are many children's voices echoing at the park where many visitors flock to admire cherry blossoms, but there was hardly anybody there. A worker at the Fukushima City Parks and Greenery Division said, "We have been trying to make it a good park." And a neighbor woman (age 78) said with tears in her eyes, "It is lonesome not to be able to hear children's voices. We never had such a quiet spring. This nuclear accident is just so disappointing." A similar sign post was installed at the Shinhama Park in the central part of the city where the radiation level was 0.1 above the regulatory limit (of 3.8 μSv/hr). Rules imposed for the neighborhood park limits children’s playtime to one hour. The radioactive fallout due to the accident is called "environmental radiation" as if it were part of nature. Discrepancies exist between the official air dose rate after decontamination and the level detected by a personal radiation detector. A house is being newly built right near a park with a daily one-hour time limit. (Incidentally, the real estate market is apparently "hot" in Fukushima City, as those who evacuated from Hama Dori, or eastern part of Fukushima Prefecture, look to settle there). Certainly, there are individual stories and circumstances about their reasons to remain where children can barely be outside. However, seeing these photos makes you wonder about the consequences. 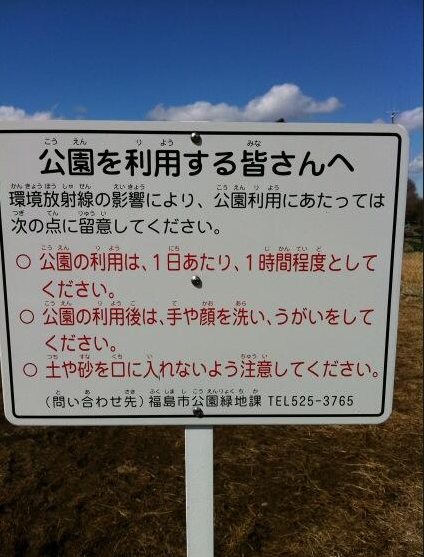 Note: A photo of a sign from Sakabuta Park in Koriyama City, Fukushima, mentioned to be from April 2013, was deleted as of November 16, 2013 due to the following reasons. Current air dose levels are not consistent with what is on the sign. The photo was obtained from a tweet, and its original source is uncertain. This oversight is deeply regretted.